Aspl06 (corresponding Aspll3 of a2A AR) of TM III of aiA-AR is highly conserved residue among Adrenergic receptors (figure 2). It is involved in electrostatic as well as hydrogen bonding interactions with (-)-NE. 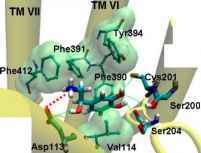 The most important interaction is formed between positively charged amino group of NE and negatively charged Asp106 of TM III of both enantiomers. The P-OH group of (-)-NE forms hydrogen bond with the Asp106 and Asp113 of TM III of aiA- and a2A-AR respectively (Figure 4A, C), whereas this interaction of P-OH group of (+)-NE with aspartate residue of TM III can not take place (Figure 4B, D). 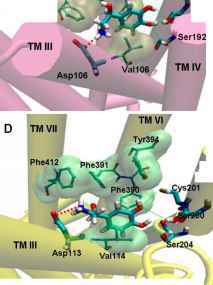 Catechol ring of NE orients towards TM V of AR and make hydrogen bond network with Ser188 and Ser192 (corresponding Ser200 and Ser204 of a2A AR) of TM V. Hydrophobic pocket is mainly formed by residues of TM VI and TM III. Phe288, Phe289 and Met292 of TM VI make one side of hydrophobic pocket while Vali04 forms other side of hydrophobic pocket of aiA-AR. These residues are involved in interaction with catechol ring of agonist. Phe390 and Phe391 of VI make one side of hydrophobic pocket while Val114 forms other side of hydrophobic pocket of a2A-AR. Figure 4. A. Interactions of (-)-NE with aiA. B. Interactions of (+)-NE with aiA. C. Interactions of (-)-NE with a2A. 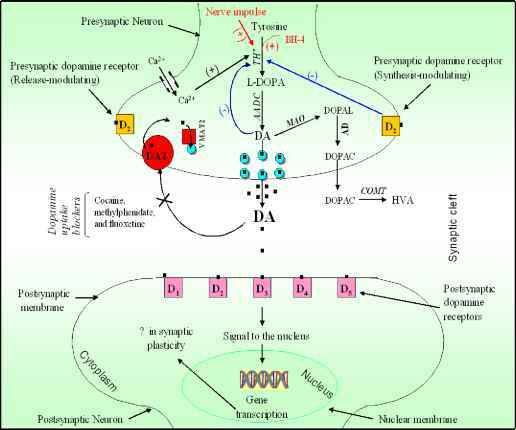 D. Interactions of (+)-NE with a2A. Transmembrane helices are shown in cartoon drawing. Red dash line denotes electrostatic interactions and green dash line denotes hydrogen bonding interaction. Surface and CPK drawing of residues involved in hydrophobic interactions are shown.